The Cathedral of the Intercession of the Virgin on the Moat is better known as the Cathedral of Saint Basil the Blessed: St Basil’s Cathedral. It is the most recognizable church in Russia. 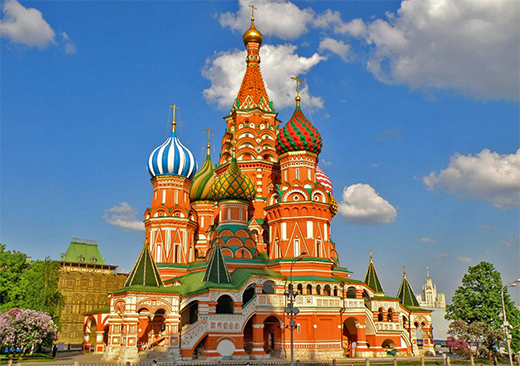 St Basil's Cathedral was built in the 16th century by order of Ivan the Terrible. Since then it has fascinated travelers coming to Moscow. Some found it bizarre; others were entranced by its unusual beauty. Many legends have been told about it: that the cruel Russian tsar had the architect blinded in order to prevent him from building a more magnificent building for anyone else, or that Napoleon wanted to destroy the Cathedral when he realized he couldn’t relocate it to Paris. What makes people invent all these stories? The fairy-tale Cathedral still dominates Red Square and impresses its beauty on our imagination. The Cathedral was commissioned by Ivan the Terrible to commemorate the capture of the Khanate of Kazan, and was constructed from 1555 to 1561. Saint Basil’s is actually a cluster of buildings - a central church surrounded by nine auxiliary churches, eight of which are dedicated to Ivan's eight victories over the Tatars, and a smaller one consecrated to Saint Basil. This popular Moscow saint was buried in the grounds and his name later became the name of the Cathedral. According to chronicles from the time, St Basil’s Cathedral was designed by two Russian architects: Barma and Postnik. They were not blinded, and in fact went to construct more churches in Russia. But this Cathedral on Red Square remains the most unusual church in Russia and has become an enigmatic symbol of Moscow itself, surviving the Revolution and Soviet times. St Basil’s Cathedral is now a museum, and the interior can still be explored. Intimate and atmospheric inside, you can follow a maze of shadowy galleries from one chapel to the next, experiencing the building’s medieval past. You can see St Basil's Cathedral during your tour of Red Square. If you have more time you will be able to visit the museum accompanied by your Moscow tour guide who can tell you more about its history and architecture.